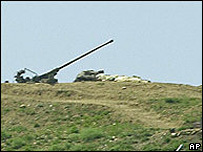 Syria has formally complained to the United Nations about an alleged raid by Israeli aircraft over its territory. The Syrian ambassador, Bashar Jaafari, said Israeli fighter planes had dropped munitions after crossing Syria's frontier last Thursday. Mr Jaafari described the incident as a flagrant violation of Syrian airspace. Israel has repeatedly refused to comment but US officials said Israeli fighters had carried out an attack on an unspecified target. Mr Jaafari said the planes had come under Syrian anti-aircraft fire. "They were fleeing and in order to speed up the planes they dropped the munitions," he said, quoted by the Associated Press news agency. "Israel is seeking military escalation. We are exerting efforts so that we don't fall into this trap." he added. "We are dealing with the matter with utmost keenness, precision and responsibility." The strike targeted a shipment of Iranian weapons which was either entering Syria or being transferred through it to Hezbollah in Lebanon, CNN said. An unnamed US official told AFP news agency he did not know the target of Thursday's alleged strike. But he said he believed it was a warning to Syria not to re-arm Hezbollah in Lebanon. Israel has not commented on the claims. "The Israelis are trying to tell the Syrians: 'Don't support a resurgence of Hezbollah in Lebanon,'" the US official said. Damascus said last week the Israeli warplanes had violated Syrian airspace in the north of the country, describing the incident as a "hostile act". "Air defence units confronted them and forced them to leave after they dropped some ammunition in deserted areas without causing any human or material damage," a Syrian military spokesman said. Witnesses said the Israeli jets had been engaged by Syrian air defences in Tall al-Abyad, north of Raqqa and near the border with Turkey. Israel and Syria remain technically at war and tensions between them have been rising in recent months. Last summer, Israel and Lebanon-based Hezbollah fighters fought a bitter 34-day conflict.